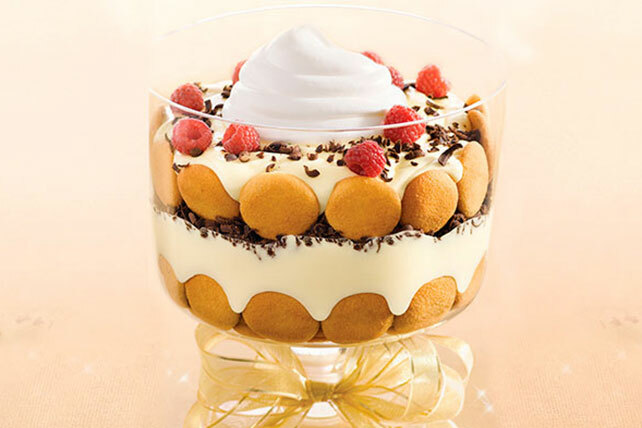 Gather up the classic ingredients—coffee, cookies and fresh raspberries—and serve this tiramisu your way: as parfaits, in a trifle or in squares. Pan: Cover bottom of 13x9-inch pan with half the wafers; drizzle with half the coffee. Top with half each of the pudding mixture and chocolate. Repeat layers. Top with remaining COOL WHIP and raspberries. Refrigerate several hours. Savor a serving of this crowd-pleasing dessert on special occasions!